Far too many law firm websites are committing bad SEO today. 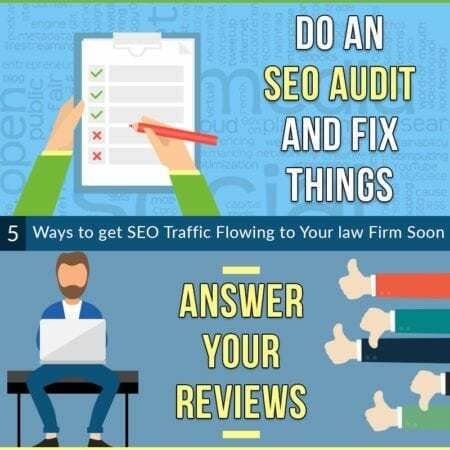 Whether it’s because you haven’t built any links, added any content, or your website is riddled with broken links and redirects, this causes problems with your lawyer SEO that results in a lack of traffic due to poor organic search visibility. Don’t sit around thinking about where things went wrong. Get busy fixing it instead. Lots of lawyers are creating and posting helpful YouTube videos but they don’t strategically link them to their own website, which is a huge mistake. These are the easiest links you can get and they come with over a billion YouTube users per month which is why they’re so valuable. Even though they’re “no follow” links they’ll still help your traffic. Make sure you create these links from your channel and in the description of each video you’ve posted. They didn’t set up Google Search Console so they don’t know if Google is having any problems with crawling and indexing their site. They didn’t set up AMP versions of their website. There are too many toxic links. A lot of unnecessary 301 redirects, broken links, and uncompressed images exist. They didn’t pay attention to page speed and website performance. Their NAP profiles around the web are inconsistent. There are multiple pages that are competing for similar keywords. There’s no attorney schema so Google doesn’t have a good understanding of your site and it can’t improve its targeting. A lot of this happens because web designers are hired to create the website and they have no clue about good attorney SEO. This is why you need to hire both so you know your website is coded correctly for SEO purposes. Primary pages target high-value keywords that are relevant to your practice areas. Secondary pages are the content pages you’ve optimized to rank for keywords that are relevant to your services. Tertiary pages target your long-tail keywords. When consumers choose a lawyer it’s usually based on their online reviews. This is why you need to respond to them in a timely fashion, regardless if they’re positive or negative. Another reason for this is that Google places a lot of weight on them. Do your best to shoot for a 4- or 5-star rating. Following up with new leads and sharing your next steps (through a video) with your client will make them more likely to work with you. Creating a lead magnet by giving away either an ebook or a premium piece of content will show your potential clients that you’re a leader in your industry. Capturing positive reviews from past clients will help drive more traffic to your site. Affordable SEO Company can fix everything on your site and help you create a successful content building strategy. Then it won’t take long for your to reap the rewards of your SEO efforts. This is something they’ve helped a lot of clients with over the years. Are you next?